Hard water (calcium & magnesium) is a common problem for many homeowners and businesses. When hardness minerals are combined with heat it forms troublesome scale. Scale causes costly build-up in your plumbing, water heater and other water using appliances. When combined with soap,the minerals form soap curd or scum that makes skin dry and itchy, hair lifeless, laundry dull and builds up on fixtures. 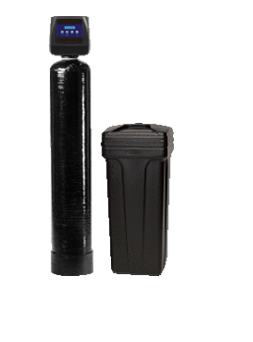 The Most Efficient Water Softener Available! Use up to 64% less salt than a standard water softener, along with a huge reduction in water usage. Upflow Regeneration with Optimal Precision Brining provides high-efficiency performance and lowest possible salt usage. Adjustable backwash frequency saves up to 2,000 gallons of water per year! Large 4 line Touch Pad LCD display. No confusing symbols or codes. Self charging capacitor keeps date / time of day for 48 hours while programming remains in permanent memory so even in the event of a power outage you do not have to re-program the controls. 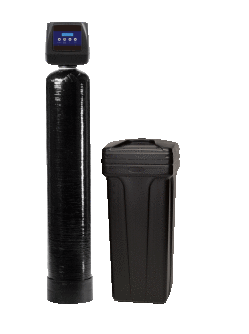 The HydraFlo can handle the most challenging household water and is available for Purchase or Rental. With the high quality media bed and easy to use controller, there is no better value on the market! NSF Certified electronic downflow control valve with proven piston, seal & spacer technology. User friendly LCD display shows time of day, regeneration mode and gallons remaining. Heavy-duty brine tank / cabinet constructed with NSF Certified high-density polyethylene.